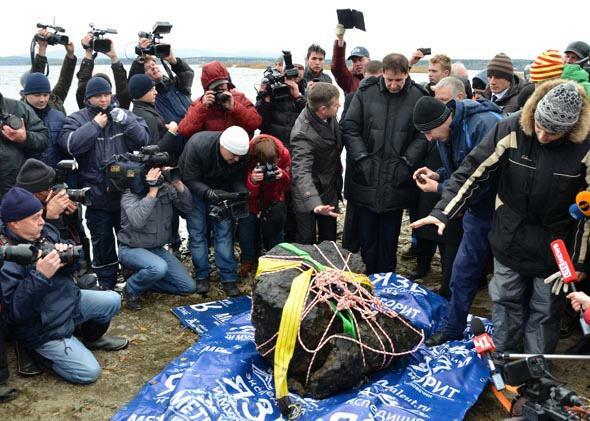 Chelyabinsk impact: Huge chunk of asteroid dredged up from lake. 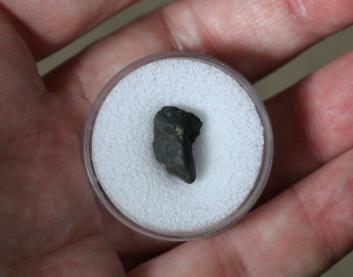 Chunk of the asteroid that exploded over Russia on Feb. 15, 2013. It weighs over a half ton. The words that keep coming to mind are holy wow: A team of divers has dredged up a half-ton chunk of the asteroid that exploded over Russia on Feb. 15, 2013. The meteorite weighs in at 570 kilograms (1250 pounds) and looks to be nearly a meter across. It was found at the bottom of Lake Chebarkul, about 70 kilometers west of Chelyabinsk. The lake is very murky, which is one reason it’s taken so long to find the meteorite. Also, the water was frozen when the meteorite hit in February. They’ve been pumping mud out from around the piece for days, as well. The original asteroid that came in was probably about 17 meters across, but exploded as it rammed through our atmosphere at hypersonic speeds — video of the event still stuns me. It was even caught by Earth-observing satellites. The explosion was at an altitude of roughly 50 km, and had a yield of hundreds of thousands of tons of TNT, shattering windows and injuring over a thousand people. A torrent of debris rained down over the Russian countryside, but until now the largest piece recovered weighed about 11 kilograms; you could hold it in both hands. This new piece is by far the largest found yet. Preliminary tests show it to be extraterrestrial in origin, so it’s very likely to be from the February impact. I’ll note that even by eye it looks like a meteorite: black crust on the outside, sculpted pits (called “regmaglypts”) caused by molten material blowing off (or “ablating”; I love these kinds of words) the rock as it flew through the air. Further tests will be done, of course. 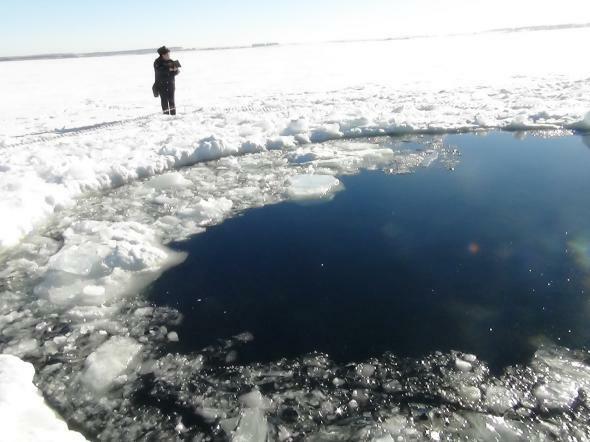 Shortly after the impact event, a huge circular hole was found in the lake’s frozen surface. I don’t know if it was from this particular chunk coming in, but it seems likely. The size is about right. And it was an obvious place to start looking for big pieces. A hole in the Chebarkul Lake made by at least one meteorite fragment, possibly the one recently found. This photo was taken shortly after the Feb. 15, 2013 event. The meteorite collector side of me can’t help thinking, “What’s this thing worth?” I’ve seen smaller pieces go for about $30/gram, though bigger pieces are cheaper per gram (my friend Geoff Notkin has a few for sale, in fact; the holidays are coming!). Even if we drop the price to $15/gram, this chunk is worth well over $8,000,000! I believe I’ve already said holy wow. A small chunk of Chelyabinsk meteorite, given to me by a friend. I suspect this one will end up in a museum, perhaps the Laboratory of Meteoritics in Moscow. I know I’d love to have it sitting on a pedestal in my living room. If any ridiculously wealthy BABloggees are reading this, well, once again, the holidays are coming. Of course, the scientific value of this meteorite is very high indeed. This may well turn out to be the best studied asteroid impact in history. We have multiple videos of it, an excellent grasp of how, where, and how fast it came in, and thousands of meteorites to examine as well. This one big piece should prove a huge boon in understanding even more of this once-in-a-lifetime event.